You are here: Home » Financial Management » The Third Way of Shopping! The Third Way of Shopping! In today’s everyday life, consumers may feel that the only way to make large purchases is through credit cards or using the cash in their account. Unfortunately, Credit cards are not always for everyone, nor people wants to take the risk of spending all the cash in their account for crazy purchases. The 3rd way gives you the best of both worlds, allowing you to buy the things you want without having to use your credit card or spend your cold hard cash. You can buy whatever you want, from Playstation 4 to the new Samsung S4, from a vacation in Europe to a brand new watch. By using the 3rd Way of Shopping, you will receive cash rewards, without having to worry about repayments or overspending. For instance, you always dream to visit Tokyo and finally, after years you decided the moment has come. With 3rd way of shopping you can save for 12 months started with RM50, setting aside RM150.00 and at the end get a total reward of RM26.58 and live your dream. Great, isn’t? Taking advantage of the 3rd way of shopping and applying it to your shopping routine is simple! On the website www.thirdway.my you can find an array of awesome deals of up to 75% off which you can book now to be paid for in the future, helping you to get the things you want most. Think of it like a 0% payment plan where you receive cash rewards rather than paying interest. Start by discovering how some of Malaysia’s more interesting personalities would use the 3rd Way of Shopping, and by booking a travel, gadget, experience, fashion, or home living deal. 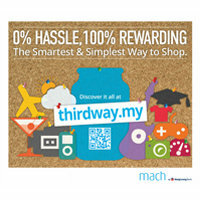 What’s more, all our deals start at RM50 and come with exclusive discounts to users of the Third Way of Shopping! Can anyone care to share your experience(s) using this method/tool?